Also called writing desks or laptop desks, leg desks are a simple design with minimal bells and whistles and a small size. Perfect for smaller spaces like a bedroom in a shared apartment or a smaller downtown condo or studio. 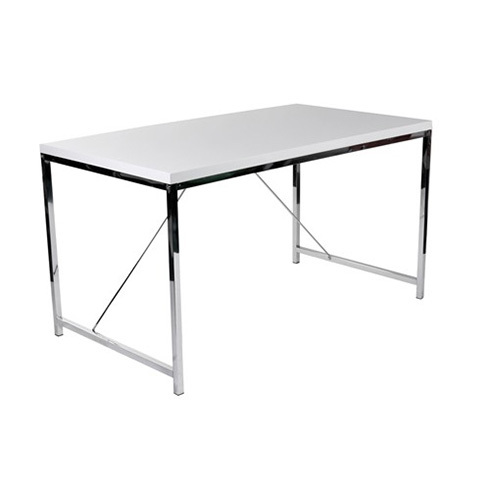 Leg desks are also great options for housing laptops and for completing everyday tasks like bill writing, to-do lists, and writing letters. If you have a large desktop computer setup, consider something with a larger work surface to hold your computer, accessories, and still have space for writing. While most leg desks feature a keyboard drawer and some feature additional drawers for small storage, other sleek and modern designs feature no drawers. This stylish option doesn't mean that you'll have clutter all over the desk top, simply look into additional options for wall organization or desktop organization. Some leg desks also have an optional hutch for storage and organization needs. Also called L-desks, corner desks are exactly what they sound like...a desk that fits into the shape of the corner. Whether you place your desk in the actual corner of the room or you place it free-standing or against one wall, you'll find that this shaped desk provides much more surface space for working and tasks. Don't stop there! L-desks and corner desks can also have additional functionality. Whether you add a hutch or you choose an l-desk that combines a table desk and a credenza, you'll find that additional storage helps keep your workspace organized! If you need a larger workspace to accommodate two people we have solutions to fit your needs too! A dual t-desk allows a comfortable space for two. Whether your kids need a comfortable place to conquer chemistry or calculus, or you and your hubby are in need of some home organization, a dual t-desk is a great solution. Of course you can customize the amount of storage and organization solutions for your workspace with dual t-desks as well! Choose a hutch, filing cabinet, bookcases, and more to organize your home office. Often featuring double pedestals with additional storage and potential filing storage, executive desks not only provide a desirable look but additional space and functionality for your busy day ahead. Additional storage, surface space, and added features like built-in outlet bars create a workspace you'll look forward to using. A workspace needs to be functional and if your home office furniture helps with organization and cord management you bet you'll be more efficient! Now, workspaces have additional features that can truly help. Take a look! Flip-top desks provide hidden storage. Built-in outlets provide easy cord management. Who says your workspace has to be boring, mundane, or 'normal'? Find something that truly inspires you for your home office because in the end it will help you get more work done...or at least allow you to do it from a stylish work space. Shop home office furniture and work space essentials in a variety of styles, sizes, and features online or visit Belfort Furniture's Furniture Campus for hundreds of room settings filled with inspiration and ideas for your home. Conveniently located in Dulles, Virginia, Belfort Furniture is proud to be named largest furniture store in Washington, DC and Northern Virginia.